I absolutely LOVE the balloon wreath I made for the Chef party we had a few weeks ago, and it's been hanging on my front door since. But I decided it was time to "Easter" my front door up. I was trying to find something just as cute, but didn't....so I decided to make my own wreath. I took a Styrofoam wreath I purchased a few weeks ago for a different project that I never got around to making. I wrapped it in some purple ribbon that I had laying around. I only used one roll of ribbon since I was being frugal with this project and wanted to use what I had on hand as much as possible. But I wanted to make sure there was some pretty color between any jelly beans. 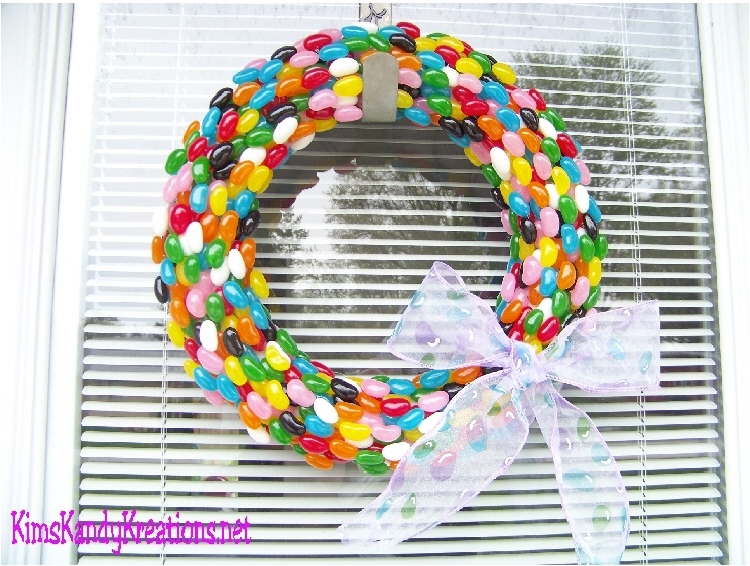 I purchased 5 bags of jelly beans at Dollar Tree, but I only ended up using 3 bags to cover the whole wreath, and one more to build up a second layer. I started in a simple zig zag pattern where I placed a roll of jelly beans and then built the next row below it filling in between. The pattern didn't last very long, but I ended up filling in the holes as I went. It took about an hour to glue all those on. I really liked how it looked, but decided to use another bag of jelly beans and layer it on top of the first layer. After gluing all the beans on, I sprayed it generously with sealer. Lastly, I added a bow with some Easter ribbon that I had in my stash and hung it on my front door. Turned out cute! And yummy! i'm your newest follower from skip to my lou :). love this idea! happy day to you. This wreath is adorable and the colors are so bright! Love it! Did everyone at your party love it too? Who doesn't love jelly beans! This is super cute. That is super cute, but I can just imagine the look of horror on my husband's face when I walk in the house with jelly beans, and then tell him that he can't eat them! This is so great! Very creative, and easy too! 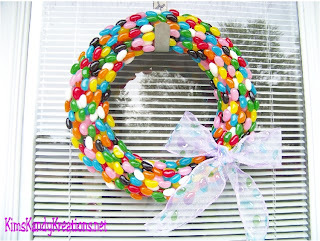 I love that it different from all the other Easter wreaths Ive seen! You were featured over at Today's Top 20! Woot Woot! Adorable!! I'd love for you to link up! Pretty AND Yummy!! Thanks for lining up to Make Something Mondays! Can't wait to see what you've made this week! This is such a cute wreath! I love all of the bright colours! I would love for you to come link up to our first ever linky party! We are even having a $50 Target gift card give away to celebrate. Thank you so much for linking up! Just wanted to let you know that your lovely wreath is being featured tomorrow so make sure to stop by and grab our 'I was Featured' button! To eat it, or not to eat it, that is the questions, lol...very cute...yet..hard to resist digging into it! Love it!